False Definitions | Curriculum Management Solutions, Inc.
Today, we’re going to talk about Canadian hockey. 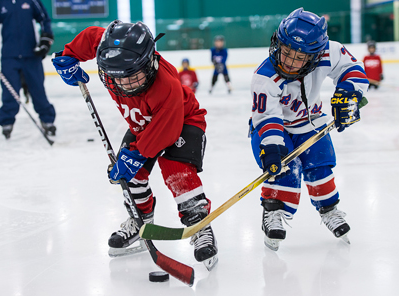 In order to become an elite hockey player in Canada, kids as young as 4 are coached and sifted and moved up until the most talented end up in the elite leagues. It is a system based on merit: if you are talented and willing to work hard, you are rewarded by the system. In his book Outliers, Malcolm Gladwell records an interesting observation about those elite hockey players: By far the greatest proportion of the very best players were born in the first 4 months of the year, and of those players, the majority were born in either January or February. The cut-off for age-class hockey in Canada is January 1. Thus, a huge proportion of players were the oldest in their age class when they began hockey at age 4. And it is a truly huge proportion: a whopping 70% of elite players were born between January 2 and June 1. Forty percent were born between January and March. So when coaches selected kids for the advanced teams, they believed they were selecting for talent; in actuality, they were selecting the oldest. It’s what happens next that’s truly interesting. Once a child is selected for an advanced league, he has access to better and more intensive coaching, more practice time (2 to 3 times more), more games (50-75 versus 20), and the opportunity to play with teammates who are also more coordinated and physically mature. As a result, he gets exponentially better at hockey than his younger age-classmates who remained behind in their house leagues. By age 13 or so, he is far more likely to be selected for the elite junior league. Sociologist Robert Merton calls this the “False Definition.” In the beginning, the false definition (these players are more talented) gives rise to new behaviors (more and better coaching, more ice time, more games) that make the false definition seem true. How does this relate to education? The false definition plays out all over classrooms, but is glaringly apparent in gifted education. Teachers identify students as gifted, but they may not be selecting for actual giftedness so much as for cultural capital: those students whose parents are financially secure and highly educated themselves and so value education and are able provide rich experiences such as travel for their children. They are also more likely to own a lot of books and use rich vocabulary with their children. A recent (2018) University of Connecticut study found that students eligible for free or reduced lunch programs were less likely to be identified for gifted education services. Also, a recent study by Vanderbilt University found that white students were twice as likely to be identified as gifted than African-American students with the same scores. So while teachers may believe they are selecting for “giftedness,” there are clearly other factors at play in the process. What happens after that selection? Selected students get better, more focused instruction from more experienced, competent teachers; they have the opportunity to move at their own pace and often to select topics of study they find personally interesting; they are often clustered with other students who are more academically advanced; they have access to accelerated math and science classes and AP coursework. Because of this change in their experiences, they pull away from their grade-level peers and become more and more advanced academically; they are far more likely to enter college and complete a degree, which increases their opportunities for employment at higher salary levels and boosts their socioeconomic status. In turn, they will be able to provide rich experiences for their own children, thus perpetuating the cycle. But, what if the narrative could be changed? What if we treated everyone like they were gifted? What then? This actually happened in a study way back in 1983. Elementary students left behind after the gifted and talented selection process were identified as potentially gifted through a process of non-verbal assessments and teacher- and peer-evaluations. Then those students were treated like gifted students — better, more focused instruction, opportunities to study topics of interest to greater depth, opportunities to work with other identified students — with some additional supports to help bring their verbal abilities up to grade level. The result was that 40% of those students went on to be identified as gifted using the traditional identification process. They were treated as gifted and as a result they became gifted. As educators, we need to resist the complacency that comes with the Bell curve: we have too often normalized the idea that a certain proportion of kids are just always going to be in that bottom tier. And then we treat them to the least cognitively demanding, least engaging types of instruction delivered by the least experienced teachers. They are stuck doing the “basics” while their more advanced peers are studying topics that truly interest them. Is it any wonder we have an achievement gap? We need to aim instead for a J-curve: an insanely unbalanced curve that indicates a majority of students succeeding because we have treated them like they can succeed and given them the supports they need to do it. What about those hockey players born in November and December? What would have happened if they had had access to the same coaching and practice opportunities as their older peers? We don’t know, really, because back when they were 6, or 7, or 8 someone decided they weren’t talented enough and they were left behind. Hockey, though, is not essential to success in modern life. Reading and writing and mathematics ability are. Leaving whole groups of children behind will have repercussions for their entire lives and the lives of their children after them.